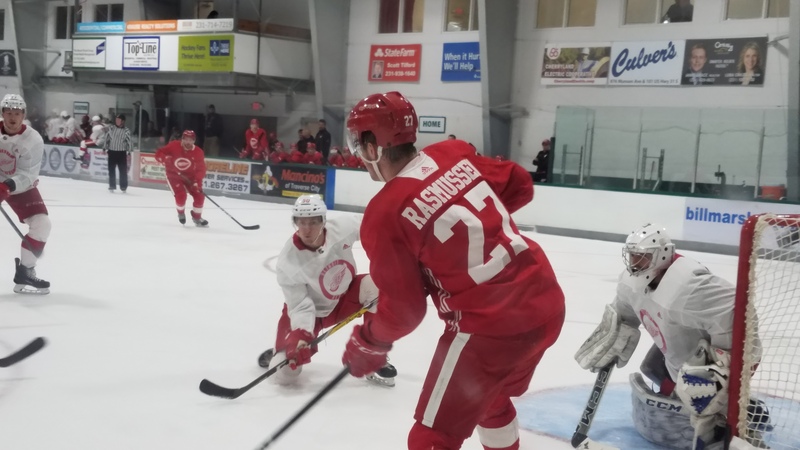 Michael Rasmussen was one to watch on Monday night, as the Red Wings took down the Pittsburgh Penguins (actually, the Wilkes-Barre Scranton Penguins roster) by a score of 4-1. Save for an errant pass into the skates of Gustav Nyquist on a 2-on-1, the first rounder was great all night long. He scored the game’s first goal on the power play, with assists from Nyquist and defenseman Joe Hicketts. Jimmy Howard was not tested often throughout the night, but when called upon, he had to make a handful of stellar saves to keep the score close. One of the highlight saves of the night came when Penguins forward Frederik Tiffels stripped a Wings defender and tried to slide the puck past the left pad of Howard. However, he was on his game, and the fans loved every minute of his play. Also in the first, versatile grinder/defenseman Luke Witkowski had a great chance in the slot. He wasn’t able to score, but this opportunity seemed to keep the fast pace of the period going. Early in the middle frame, Anthony Mantha scored from defenseman Dennis Cholowski and Dylan Larkin. It was a skilled power forward drive to the net. He powered his way past the defender, showing great hand-eye coordination with the puck, and potted the goal with finesse. He seems poised to have a great year. “It means a lot,” said Cholowski of playing exhibition games. “Every young player wants to get in some games, and I’m lucky enough to have played three now. Hopefully I get a few more too. I’m really happy about it. Mantha had another great net drive which nearly resulted in another score, but linemate Tomas Tatar was unable to flick the puck toward an open net. Rasmussen had an additional break along with Tatar, in which he poked the puck laterally for a nifty one-timer attempt. Tatar scored an unassisted goal with Rasmussen screening the netminder to make it 3-0. Five minutes later, Pittsburgh’s Scott Wilson put the Pens on the board with a breakaway goal. Assists went to Olli Maatta and Zach Trotman. Tom McCollum saw some action in the final stanza. He was re-acquired in a trade with the Calgary Flames in July. Many will remember him and Petr Mrazek backstopping the Grand Rapids Griffins to a 2013 Calder Cup championship. He did not allow a goal in the 20 minutes he played. Xavier Ouellet potted an empty net goal to seal the 4-1 victory. Frk led the team in shots with 4. Detroit had 27 shots to Pittsburgh’s 19. Dylan Sadowy and Luke Witkowski each registered five hits. The Red Wings host the Chicago Blackhawks on Thursday and the Toronto Maple Leafs on Friday at Little Caesars Arena.